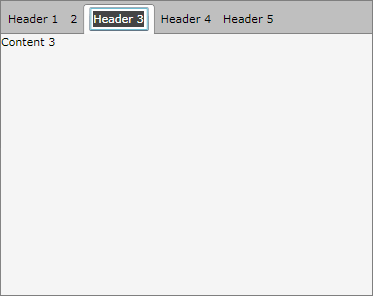 The goal of this tutorial is to create a tab control with editable headers of the tab items. The idea is to allow runtime change of the tab item's header text as shown on the snapshot below. First add references to the assemblies Telerik.Windows.Controls and Telerik.Windows.Controls.Navigation. Then create a new Silverlight Templated Control - EditableTabHeader that derives from ContentControl and leave it empty for now. Create a new style for the EditableTabHeader control. In the XAML code above we create new style for the EditableTabHeader control and this style will be the default template for that control. The template is made of ContentPresenter, TextBox and a state group EditStates with two new states EditMode and ViewMode. The "EditMode" state contains a storyboard that hides the content presenter control and makes the text box visible, while the ViewMode state does nothing, which means that when the control is in this state it will have its default appearance. Add the following implementation to the code behind of the EditableTabHeader class. The control contract definition is done using two attributes of type "TemplateVisualState" placed right above the class definition. With this contract we declare all of the existing states and parts for that control. New dependency property IsInEditMode of Boolean type was added. One text box field declaration plus three additional fields related to the editing. The text box field is initialized with the reference from the text box defined in the template when the base method OnApplyTemplate is invoked. Call back method OnIsInEditModeChanged invoked every time the value of the dependency property IsInEditMode is changed. This method changes the state of the control depending on the value of the IsInEditMode property. The method OnMouseLeftButtonDown was overridden to move the control from View to EditMode state and vice versa depending on some internal logic for edit. In the XAML code above we create new rad tab control and predefine its ItemTempalte and ItemContainerStyle. In the ItemContainerStyle definition we set the HeaderTemplate of the control to the EditableTabHeader control. EditableTabHeader control will use automatically the default template defined in the Themes\Generic.xaml file.